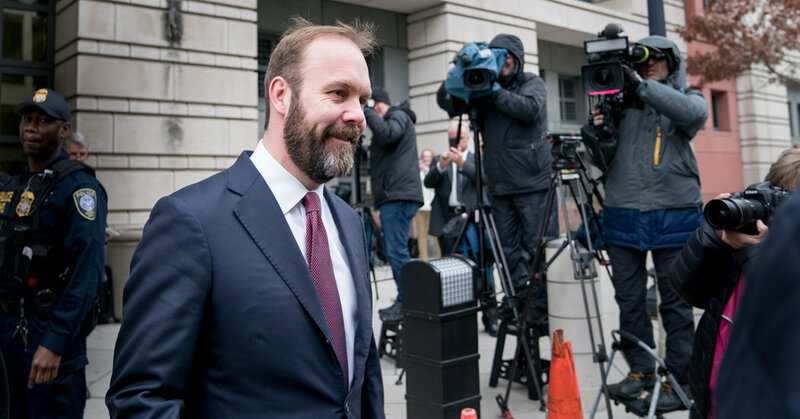 ALEXANDRIA, VA. — Rick Gates, Paul Manafort’s right-hand man for years, began testifying against his former boss on Monday in federal court in Alexandria, Va. He is considered the most important witness in Mr. Manafort’s trial on tax and bank fraud charges. Mr. Gates admitted to a wide variety of crimes, including bank fraud, tax fraud, money laundering, lying to federal authorities, lying in a court deposition and stealing hundreds of thousands of dollars from Mr. Manafort’s accounts by falsely claiming expenses. While giving testimony, Mr. Gates was grim and sober-faced, frequently looking down or straight ahead — but never looking at Mr. Manafort. Mr. Manafort stared back at Mr. Gates. The outcome of the closely watched trial, now in its second week, could hinge on whether the jury believes the testimony from Mr. Gates, 46, who has pleaded guilty to conspiracy to commit fraud and lying to federal authorities and faces a prison term of up to six years. Mr. Gates’s testimony also underscores the trial’s stakes for the White House. Mr. Manafort was Mr. Trump’s campaign chairman, but resigned from the campaign in August 2016 after just five months. Mr. Gates, the deputy chairman, remained on the campaign as a liaison to the Republican National Committee through the election. Mr. Gates was named deputy chairman of Mr. Trump’s inaugural campaign, raising huge sums for the event. The trial is the first stemming from charges brought by the special counsel, Robert S. Mueller III, who is investigating Russia’s attempts to influence the 2016 election. As Mr. Manafort’s most trusted aide, Mr. Gates was privy to detailed information about Mr. Manafort’s personal and business associates, including exactly how much he paid for his season sports tickets. Another accountant was more compliant, accepting financial documents from Mr. Gates that Mr. Manafort used to obtain a bank loan even though she testified that she believed the documents were fraudulent. Mr. Gates was quick to compliment her after she wrote a letter to the bank that cited the falsified documents, despite her suspicions. “Paperwork is awesome,” he wrote in one email to her. Mr. Gates and Mr. Manafort were so close that some witnesses referred to them in one breath, almost as if they were one person. Now Mr. Gates’s testimony could help decide whether Mr. Manafort, 69, spends what could be the rest of his life in prison. The most serious of the 18 charges he faces carries a maximum of 30 years in prison. Mr. Manafort’s attorneys hope to show that Mr. Gates stole millions of dollars from Mr. Manafort and now is blaming him for financial crimes he himself committed. Mr. Manafort’s biggest mistake, they have told the jury, is that he trusted Mr. Gates to handle his finances because he was too busy running his political consulting firm. Before Mr. Gates was called, Mr. Manafort’s defense team cross-examined Cynthia Laporta, an accountant who handled Mr. Manafort’s tax returns. On Friday, Ms. Laporta testified that Mr. Gates gave her documents she believed were false. When Kevin Downing, one of Mr. Manafort’s attorneys, asked why she did not call Mr. Manafort, she replied: “I think in most instances, it was clear that Mr. Manafort was aware of what was going on.” She also testified that she copied Mr. Manafort on numerous emails. Mr. Downing also presented evidence that, from 2005 to 2015, Mr. Manafort paid nearly $8.4 million in federal taxes on a $30 million adjusted gross income.